President Michel Temer’s decision to send troops into Rio de Janeiro officially killed not only Brazil’s pension reform, but also remaining hopes that he might tackle the litany of structural changes to the tax, labor, education and regulatory systems that economists and investors see as the country’s economic salvation. Yet these now-defunct reforms aren’t the only way to bolster growth. Trade matters as much or more for juicing gross domestic product, as the influx of goods, services and competition can help attain the economic holy grail of rising productivity. And given the U.S. protectionist pullback, opening to the world could, for once in Brazil, be politically popular in this election year. Brazil has always been a reluctant trader. Despite its natural resource bounty, it remains one of the world’s most closed economies. Its handful of formal trade agreements give it preferred access to just 10 percent of global markets and contain hundreds of exceptions, diminishing their reach and heft. These self-created handicaps keep Brazil out of the more profitable parts of global supply chains, instead largely stuck supplying raw materials to other nations’ factories. And the relatively heavy taxes on imports drive up costs for local companies and consumers alike. Yet Brazil’s lofty barriers also mean that reform could bring much more bang for the buck. A 2014 McKinsey study estimated that by opening its economy, Brazil could add 1.25 percent to annual GDP growth, more than labor or regulatory reforms would bring, and similar in scope to a total tax overhaul. These economic benefits from trade matter even more as Brazil’s population ages. From 1990 to 2012, new workers drove more than half of all GDP gains, some 1.8 percent a year. Yet this demographic bonus is ending -- in less than a decade, Brazil’s children and elderly will outnumber its breadwinners -- and that will cause a once-reliable engine of growth to sputter. Brazilian politicians understand the costs of protection. They give national aerospace champion Embraer the freedom to import equipment and components free of the tariffs other industries face. Their jets are now globally competitive. This stands in sharp contrast to Brazil’s automakers, which enjoy no such privileges. Brazilian cars as a result take twice as long to make and are 40 percent more expensive than those in Mexico. 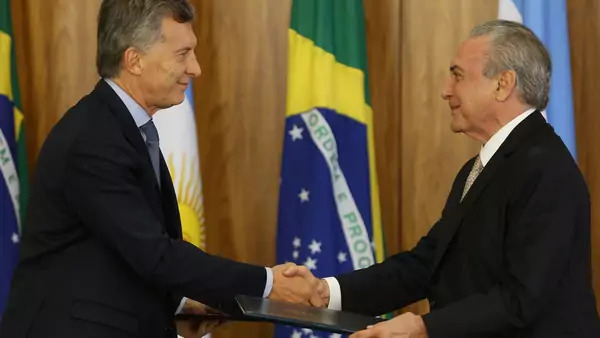 Their paltry exports go largely to captive Mercosur trading partner Argentina. The political timing for opening up may finally be right. Trump’s penchant for threatening -- if not breaking -- so many extant trade deals could spark reconsideration of an issue that used to be all but taboo in Brazil’s politics. In a country where fewer than two in 10 people like the U.S. president, anti-Trump issues can be in vogue. And by pulling back, the U.S. has given Brazil space to shape new accords more to its liking. The power struggle that sunk the Free Trade Agreement of the Americas in the mid-2000s has faded with America’s absence. EU-Mercosur talks are the place to start. After nearly two decades of on-again, off-again talks, the participants are trying to break through standoffs on agriculture and rules of origin. Trump’s recent tariff hikes on steel and aluminum tariffs, hitting industry on both sides of the Atlantic, could foster the camaraderie needed to overcome the last sticking points. Also ripe for a Brazilian rethink is the Pacific Alliance. Founded by Mexico, Colombia, Peru and Chile, the ambitious agreement goes after not just tariffs but also barriers to investment, services and the movement of people. Brazil’s participation would jump-start aspirations for Latin American economic integration. Most ambitious would be joining the revised Trans-Pacific Partnership, opening nearly a third of the world’s markets to Brazil’s companies, and changing the way government procurement, intellectual property protection, and public and private credit work in the Southern Cone nation. Dropping barriers would bring turmoil to some sectors, no doubt. In the 1990s Brazil unilaterally reduced tariffs on many goods -- leading imports to double as a percentage of the economy even as exports stagnated. Many unproductive companies faltered and failed, and some of their former employees have yet to recover. Brazil’s clothing and shoe factories and gas production are similarly vulnerable to more opening, even as car makers and other advanced manufacturers stand to gain. Yet for Brazil to grow faster for longer, it has to become more globally competitive. The now-stymied internal structural reforms are one path; economic opening is the other. And as Embraer and the many agro-businesses show, when given a bigger and more level playing field, Brazil’s companies can thrive. But they need the preferred access to markets that trade agreements would bring. Law and order and anti-corruption promises dominate the early presidential campaign slogans. Yet polls show Brazilians care most about their pocketbooks. Trade’s promise of cheaper and better goods could appeal to middle- and upper-class Miami-bound shoppers and poorer Bolsa Familia recipients alike. And for the broader economy, it would bring a much-needed win. View article originally published on Bloomberg View.